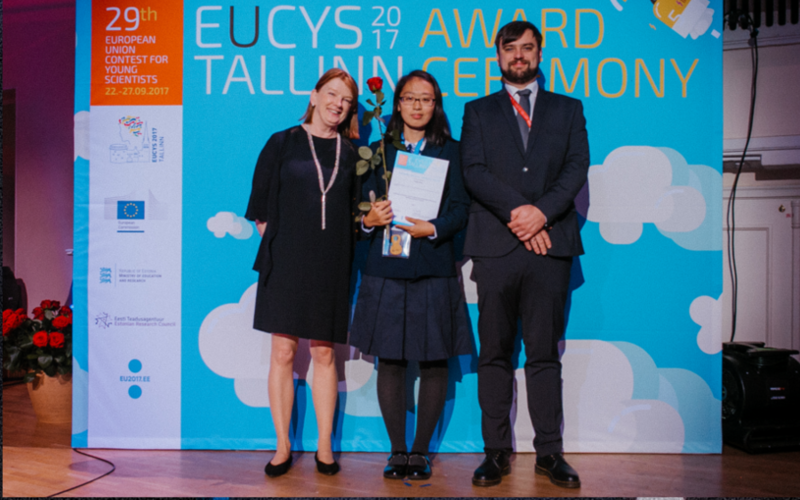 Songrui Zhao is the winner of the 2017 EUCYS EuChemS Award with her project entitled A Research on Synthesis, Characterization and CO2 Absorptive Character of Pyridinium-based Ionic Liquids. Songrui Zhao synthesized three kinds of pyridium-based ionic liquids as new solvents for CO2 capture. Their physical properties and CO2 absorbing abilities were measured, calculated and analyzed. The cycling abilities and absorbing principle of these liquids were also discussed. The results show that the three kinds of ionic liquids can absorb CO2 efficiently and can be recycled completely. The new liquids can be widely used in industrial CO2 capture process. EuChemS special prize for best chemistry contribution at the European Union Contest for Young Scientist, is attributed every year at EUCYS to a young scientist for hers/his research work in the field of chemistry. EUCYS, an initiative of the European Commission that was set up in 1989 with the goal of promoting cooperation and interchange between young scientists and guiding them towards a future career in science and technology.